The McDonnell Douglas (currently Boeing) F-15E, otherwise known as the Strike Eagle, is an all-weather, twin-engine, tandem-seat jet fighter. As a high-supersonic strike fighter based on the F-15 Eagle family of air superiority fighters, the F-15E was designed in 1978 to fill the role of a “Dual Role” fighter; one capable of penetrating deep inside hostile airspace to destroy ground targets (as in Deep Air Support or DAS), while retaining the ability to effectively take on enemy fighters without dedicated fighter escorts. Engaging in air combat can typically be split into two modes: Offensive and Defensive Counter Air, abbreviated as OCA and DCA respectively. Both of which are the core principles behind fighter design. The concept of combining the high-speed and maneuverability of a fighter, with the aerodynamic stability and ruggedness of an attack jet was first realised in the Tactical Fighter Experimental (TFX) program, from which the General Dynamics F-111 Aardvark was developed. With its introduction in 1988, the F-15E Strike Eagle supplanted the existing F-111 Aardvark. The F-111 is a twin-engine, supersonic, variable-sweep wing, two-seat fighter-bomber, and is the world’s first production aircraft to feature afterburning turbofan engines and variable-sweep wings. Variable-sweep refers to the ability to vary the angle of the wings in flight; the wings are electro-mechanically swept to the rear and to forward or original position via pivots on the wing roots, located on both sides of the fuselage. This resulted in an aircraft that was readily adaptable to stable subsonic and supersonic flight, from as low as 400km/h up to 2,500km/h. The Aardvark, whose name comes from its long and slender nose, which houses an AN/APQ-110 Terrain-Following Radar (TFR), is known for its ability to perform low altitude air strikes at supersonic speeds. The TFR detects ground features to automatically guide the aircraft through valleys and mountain passes. This, along with its variable-sweep wing design, enabled the Aardvark to hit High-Value Targets (HVTs; such as artillery pieces, missile launchers, and command posts) well within denied territory at astounding speeds. 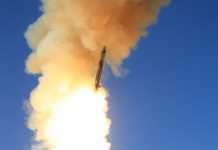 This strategic deep strike capability played a major role in the Cold War, especially in the American-allied European region. – F-111A initial production model. Developed into FB-111A strategic bomber variant with larger engines and payload stores to accommodate AGM-69 nuclear missiles. Later retired in 1991 and replaced by the B-1 Lancer, which sported a similar airframe design. – F-111B Fleet Air Defence (FAD) variant fitted with advanced long range radar, capable of scanning while tracking radar signatures and locking onto 6 individual targets simultaneously. Other combat aircraft radars at the time could only either scan for or track signatures. The F-111B was not selected by the US Navy in favour of the Grumman F-14 Tomcat (having the same variable-sweep wing design and engines), which was subsequently replaced by the lightweight and more compact F/A-18 Hornet. – F-111D variant featuring improved air intakes designed to reduce engine stalling, with engines putting out 82kN of thrust each. – F-111F variant with more affordable Mark IIB avionics, Pave Tack infrared targeting and laser guidance pod for precision bombing, as well as newer engines producing 112kN of thrust each. – EF-111A Raven Electronic Warfare (EW) variant equipped with AN/ALQ-99E radar jammer, capable of detecting, intercepting and jamming radio signals. This makes the Raven essential not only in Electronic Warfare, but also in Search and Rescue (SAR) operations where it can seek out the location of a downed pilot’s radio. Prominently used in Operation Desert Storm during the initial phase of the air campaign, in coordination with F-15E and F-15C aircraft. The F-15 Eagle was designed in December 1969 to replace the McDonnell Douglas F-4 Phantom II. Experiencing serious problems highlighted from air combat seen in the Vietnam War, the United States Air Force (USAF) sought to procure a fighter aircraft with more effective radar and weapon systems, albeit with similar or even higher speed and longer combat radius than the F-4. This move was met with much controversy, owing to a series of flaws in the F-4’s design and projected combat performance. There was stiff opposition from a group of USAF officers and aerial warfare analysts called the Fighter Mafia, which was primarily led by John Boyd and Pierre Sprey. They argued that the Air Force should use a dedicated fighter weighing less than 9.1 metric tons (20,000 lb), without any provisions for ground attack or even the use of technologically-advanced radar. This became the Light-Weight Fighter (LWF) program, which would result in the General Dynamics F-16 Fighting Falcon in 1974. To understand the significance of this, it helps to look at the doctrine and actual performance of USAF F-4 fighters in Vietnam. In the decades immediately following World War II, the USAF employed the doctrine of using jets chiefly as interceptor aircraft, where the primary mission was to eliminate enemy bombers and attack aircraft before they could threaten friendly surface units. The priority targets being Soviet strategic bombers armed with nuclear munitions. The Air Force was of the opinion that missiles, namely the AIM-9 Sidewinder and AIM-7 Sparrow, had made the use of guns obsolete, and that their premier fighter need not feature such a weapon. They felt that dogfighting was a thing of the past, and focused on fielding a fighter with impressive long range, high-speed capabilities. However, the reality of fighters engaging in dogfights was very real, as they would later find out. USAF top brass had failed to consider the inherent value that such a high-volume weapon, like that of a rotary gun, provides in a close range, sustained turning fight. Their doctrine was absolutely dependent on radar tracking and missile seeker capabilities, which to many pilots’ dismay and frustration, did not live up to expectations at the time. Most of the AIM-7 semi-active radar-guided missiles launched in the Vietnam War failed to track their targets or even start their motors due to the tropical conditions, rendering them useless entirely. 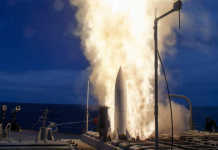 According to Barry D. Watts in his study Six Decades of Guided Munitions and Battle Networks, only 97 of the 612 AIM-7 (D, E and E-2 variants) missiles fired managed to hit their targets. In line with USAF’s aerial warfare doctrine of sortieing high-speed, long range interceptors, the Phantom II was designed from the outset to employ air-to-air missiles be a Fleet Air Defence fighter for the US Navy in 1960, then later adopted as a fighter-bomber by other branches of the US military, namely the Air Force and Marine Corps. The main design drawbacks that the F-4 had were its sub-par sustained turn ability due to its relatively large mass, and the lack of an internally-mounted gun, exacerbating its performance in subsonic dogfights. This put the Phantom at a significant disadvantage when engaging smaller and more agile MiG-17, MiG-19 and MiG-21 fighters for the most part of the War. These second- and early third-generation MiGs often outperformed the less agile F-4s in Within Visual Range (WVR) engagements, using auto-cannons and their superior maneuverability to their advantage. The Phantom’s saving grace was its superior thrust, which enabled it to out-climb and rapidly disengage its opponents. To address the lack of a close range, high-saturation weapon, the USAF introduced the SUU-16 external gun pod on the F-4E variant, which housed an M61 Vulcan 20x102mm rotary cannon. The SUU-16 gun pod was mounted under the fuselage, giving the F-4E a slight edge in close range engagements. That said, the SUU-16 was not without its problems. The external gun pod increased drag on the F-4E’s airframe, along with the added weight of the rotary gun and the ammunition it used. Furthermore, many of the M61 Vulcans were inaccurately sighted in, resulting in pilots having a hard time landing their rounds on enemy aircraft. Since Vietnam, the Air Force has redesigned their fighter training doctrine, which makes aerial gunnery and Air Combat Maneuvering (ACM) an essential component for all aspiring fighter pilots. The USAF Weapons School was activated in December 1965 to provide graduate-level, instructor academic and flying courses to Air Force officers. The US Navy set up their own Fighter Weapons School (more commonly known as TOPGUN) in 1969 to equip fighter pilots with the skills and expertise necessary in modern aerial warfare. Such doctrines would eventually prove their worth over 20 years later in Operation Desert Storm, where American pilots outmaneuver and outgun battle-hardened Iraqi pilots. At the time, the Cold War (mainly between the Soviet Union and the United States) was reaching boiling point, with Saigon (capital of South Vietnam) falling into Communist rule. The Soviets had gathered intelligence on the USAF’s experimental XB-70 Valkyrie high-supersonic strategic bomber, when one of the prototypes crashed in June 1966. Realising that the Americans had the technology to develop a strategic bomber capable of penetrating their airspace at an unbelievable 3,300km/h (Mach 3.1), the Soviet designers at Mikoyan-and-Gurevich (MiG) quickly developed an interceptor based on the Valkyrie’s features. The resulting aircraft was the MiG-25 Foxbat, constructed using titanium, and capable of rivaling the XB-70’s speed and altitude. The Foxbat was revealed to public for the first time in 1966 as a state-of-the-art fighter during a Soviet military parade. The USAF pushed for a new fighter that could counter this new threat, and McDonnell Douglas was eager to improve upon its F-4 Phantom II. With advancements in computer technology, McDonnell Douglas went back to the drawing board. Engineers made use of more efficient and effective radar, coupled with a lightweight composite airframe and an internally-mounted M61, developed the F-15 Eagle in July 1972. The F-15A initial production model was a single-seat, highly-maneuverable fighter jet capable of reaching speeds up to 2,700km/h at high altitude. It also holds the distinction of being the only known USAF fighter to ever successfully launch an anti-satellite missile, the ASM-135 ASAT. The F-15A, along with the F-15B tandem-seat, supersonic jet trainer, formed the basis for the F-15C air superiority fighter. The F-15C is currently in use by 5 countries around the globe, including Japan, South Korea and Israel. The F-15 features a superplastically-formed titanium, aluminium alloy, and carbon-reinforced epoxy airframe with a single bubble canopy cockpit. Compared to the analog cockpit of the Phantom II, the Eagle’s cockpit provides a wider field-of-view and thus improved situational awareness for the pilot. Another significant improvement over the F-4E which the F-15C had was the programmable AN/APG-63 radar with “look down, shoot down” ability, enabling the radar to distinguish aircraft and ground vehicles below the horizon. The AN/APG-63 was also able to identify targets through dense cloud, heavy rain, thick smoke, and snow, making it impervious to weather conditions. The F-15 was considered hefty when compared to the single-engine F-16. That said, the Eagle possessed a higher thrust-to-weight ratio, payload capacity and was much more aerodynamically stable than the F-16. Despite its considerable size, the F-15 proved that it was perfectly capable of holding its own in a dogfight, managing to outmaneuver a Northrop F-5 Tiger II fighter at subsonic speeds. Like the F-16, the Eagle is capable of pulling an impressive 9Gs in sustained turns, at the risk of the pilot blacking out and losing control of the aircraft. The F-15 maintains a perfect record of over 104 kills with zero losses in air-to-air combat to date. McDonnell Douglas originally designed the F-15 as a dedicated air-superiority fighter with “not a pound for air to ground”. However, the Light Grey, as the Eagle is also called, proved to be a very capable platform for the all-weather, precision strike role that the Aardvark was designed to perform. Thus, the engineers gave the Eagle a design overhaul under the Enhanced Tactical Fighter (ETF) program in the early 1980s, and unveiled the F-15E “Dual Role” fighter on the 11th of December, 1986. The F-15E is derived from the F-15D tandem-seater, and is fitted with the AN/APG-70 radar for higher reliability, while building upon the already superb simultaneous detection, identification and tracking capabilities of the AN/APG-63. Apart from the AN/APG-70 and later variants of the AN/APG-63 phase-Doppler radars, the Strike Eagle is also equipped with the Low Altitude Navigation and Targeting Infrared for Night (LANTIRN) pod, located on the centre-right of the undercarriage. The LANTIRN pod is a combination TFR, Forward-Looking Infrared (FLIR) and laser designator suite, allowing the F-15E to perform precision strikes at night and in less-than-ideal weather conditions, while flying nap of the earth (using terrain masking to evade radar detection). A unique design feature which the Strike Eagle possessed was the conformal fuel tanks (CFTs), derived from McDonnell Douglas’s Fuel and Sensor, Tactical (FAST) Pack. The FAST Pack was an add-on module to the Light Grey, for the purpose of extending the range and providing independent targeting, tracking and delivery of laser-guided precision munitions. This capability was first demonstrated on a modified TF-15A in 1980. The CFTs come as standard on the Strike Eagle, forming the unique curve beneath the wings along both sides of its fuselage. Like its direct predecessor the FAST Pack, the Strike Eagle-exclusive CFTs offers enhanced combat capabilities without compromising on flight performance. They stored 1,456 liquid gallons of JP-4 jet propellant (5,511 litres), in addition to the 2,019 gallons of fuel carried in its internal fuel tanks. This adds up to a total fuel capacity of 3,475 gallons (13,154 litres), stretching the Strike Eagle’s range to over 3,840km. The CFTs also provided more pylons (external weapon stations; hardpoints for mounting munitions), which greatly expanded the F-15E’s offensive and defensive capabilities. The Strike Eagle possesses a very large payload, compared to fighter aircraft of similar size and role. A non-exhaustive list of the load-out configurations and capacity is shown below. – Two AIM-120C 18.1kg active radar-guided Advanced Medium Range Air-to-Air Missiles (AMRAAMs) on each wing pylon (total of 4 AMRAAMs). – One 610-gallon external fuel tank (2,309-litre EFT) can also be mounted on the bottom of each wing pylon in addition to the aforementioned air-to-air missiles (total of 2 EFTs). These EFTs provide enough fuel for the F-15E to fly up to 3,900km without refueling, and can be jettisoned (dropped) to reduce drag when the situation calls for air combat maneuvering (ACM). – Three Mk-82 226kg unguided bombs under each CFT (6 bombs in total). – One 2,309-litre external fuel tank. 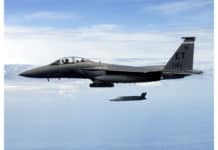 With such a large array of payload combinations, the F-15E can be readily adapted to suit any mission conceivable in the modern theatre of war. Air-to-air missile load-out can be configured in any order of the above for combat sorties, the most common usually being two AIM-120Cs and two AIM-9Ms mounted on the outer and inner wing stations respectively. A well-trained pilot and Weapon Systems Officer (WSO) make the Strike Eagle the pinnacle of multirole fighter aircraft, capable of extraordinary feats of speed, maneuverability, and endurance. The fact that an Israeli Air Force F-15D was able to survive a mid-air collision with an A-4 Skyhawk during a training exercise in May 1983, stands as a testament to the robust airworthiness of the F-15’s airframe. 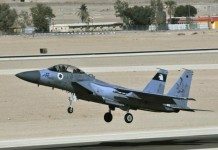 Lighting up afterburners, said F-15D pilot Zivi Nedivi managed to regain control of his fighter after it had its right wing completely torn off. Amazingly, he made a successful but high-speed emergency landing at the nearest airfield, which destroyed the tail-hook he had lowered prior to landing. Apart from the F-15C and F-15E legacy aircraft in current Air Force service, there are other variants (both existing and proposed) that seek to thrust the Eagle into the 21st century and beyond. 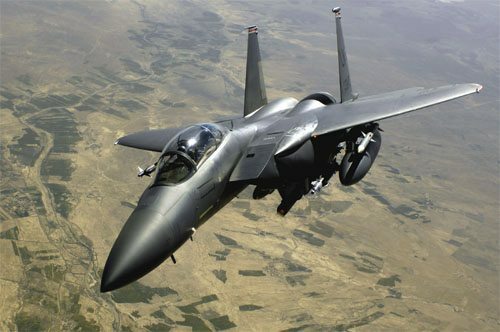 The Republic of Korea Air Force (ROKAF) made the decision to acquire an advanced variant of the Strike Eagle in April 2002, known as the F-15K Slam Eagle. Development of the F-15K was set in motion by Boeing in 2003, with delivery for 40 Slam Eagles starting in October 2005. The Slam Eagle features several modifications from the USAF F-15E, including a Joint Helmet Mounted Cueing System (JHMCS), AN/APG-63(V)1 Active Electronically-Scanned Array (AESA) radar, Link-16 and the F-15K exclusive AN/ALQ-135M electronic countermeasures system. The F-15K is also configured to carry the AGM-84E Standoff Land Attack Missile-Expanded Response (SLAM-ER) cruise missile. Many Eagle pilots agree that the Slam Eagle boasts the best avionics of all F-15 fighters ever produced. A noteworthy performance improvement on the F-15K is the General Electric F-110 GE-129 powerplant, giving it a slight increase in thrust output. Another F-15E derivative designed for the 21st century is the F-15SG, in use by the Republic of Singapore Air Force (RSAF). It shares many of the capabilities found on the F-15K, but features a Lockheed Martin AN/AAQ-33 Sniper XR targeting pod the typical LANTIRN pod. This provides the F-15SG with the latest Infrared Search and Track (IRST) capability, which also features a real-time data recording system for aerial reconnaissance use. 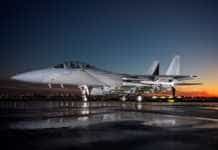 Boeing has also proposed a 5th generation stealth variant of the F-15E, called the F-15SE Silent Eagle. It will feature Conformal Weapons Bays (CWB) built into the existing CFTs, which will provide a lower radar signature with internal carriage for AIM-9s and AIM-120C/Ds. The Silent Eagle also incorporates Radar Absorbent Material (RAM) and vertical stabilisers that are canted outwards by 15 degrees to further reduce detection by aircraft radar, mostly against the X-Band type. These state-of-the-art Strike Eagles are set to fly faster, soar higher, and strike deeper in the 21st century, bringing honour the legacy and success that was their Cold War predecessors.